What’s the Science Behind Yawning? Home > California Health Insurance News > Health News > What’s the Science Behind Yawning? Everybody yawns. It’s a natural occurrence that few people think about. Yet it’s a strange, involuntary action, one that seems to be contagious. When one person in a room yawns, it’s only a matter of seconds before a few other people begin yawning too. Have you ever wondered why? Scientists at the University of Nottingham recently looked into why yawning seems to be such a contagious reaction. It turns out that the part of the brain responsible for triggering the yawn is the primary motor cortex, which is responsible for motor function. This part of the brain is also partly responsible for conditions such as Tourette’s syndrome. Contagious yawning is actually a form of echophenomena, which is an automatic imitation of words or actions performed by others. It’s something that is seen in conditions such as epilepsy. Scientists performed a study to find out what was happening in the brain during echophenomena. During this study, they monitored 36 subjects while they watched other people yawning. Some of the subjects were encouraged to yawn if they had to, while others were told that they had to try and suppress the yawn. The study revealed that the extent of the urge to yawn came down to how the primary motor cortex of each subject worked. The more excitable it was, the bigger the urge. This excitability in the motor cortex can also be increased through the use of TMS (transcranial magnetic stimulation). These findings could prove to be useful in terms of reducing the effects of such conditions as Tourette’s and dementia. TMS could potentially help modulate imbalances in the brain networks. 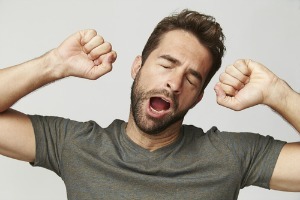 However, while the strength of the urge to yawn as a result of its contagious element could be traced to the motor cortex, the actual cause of yawning is still unknown. Scientists are continually making advancements regarding human function, such as identifying why yawning is so contagious and using those findings to improve our health. For all the latest health news, visit us at The Benefits Store today.